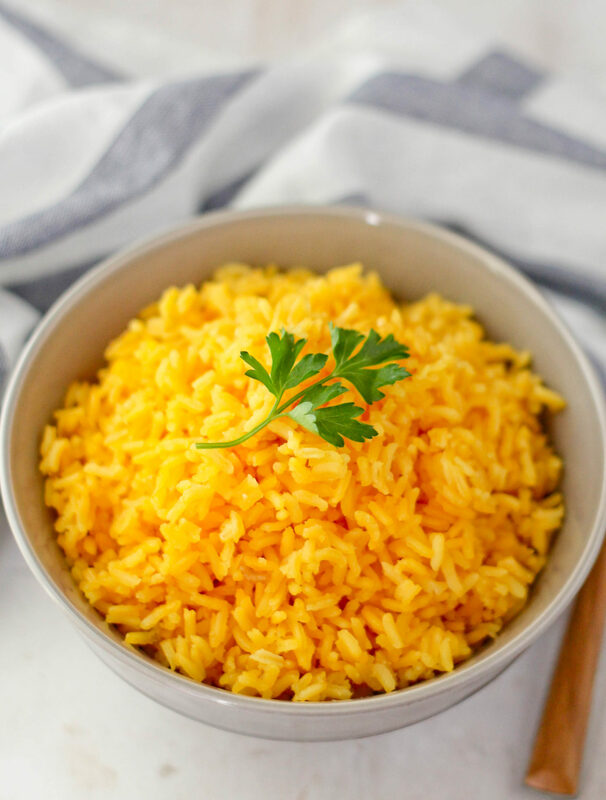 If you’ve been following my blog for a while then you know that it’s no secret that I love rice so it shouldn’t come as a surprise that I’m sharing yet another rice recipe and this time it’s for yellow rice! I’ve shared multiple recipes over the years like coconut ginger rice, beef and shrimp fried rice and chicken chorizo and shrimp pelau , just to name a few. The truth is we eat rice almost daily and in the past few months yellow rice has been in heavy rotation. I find myself making it as often as once a week; it’s super easy, delicious and the kids love it and I’m slightly addicted to it. 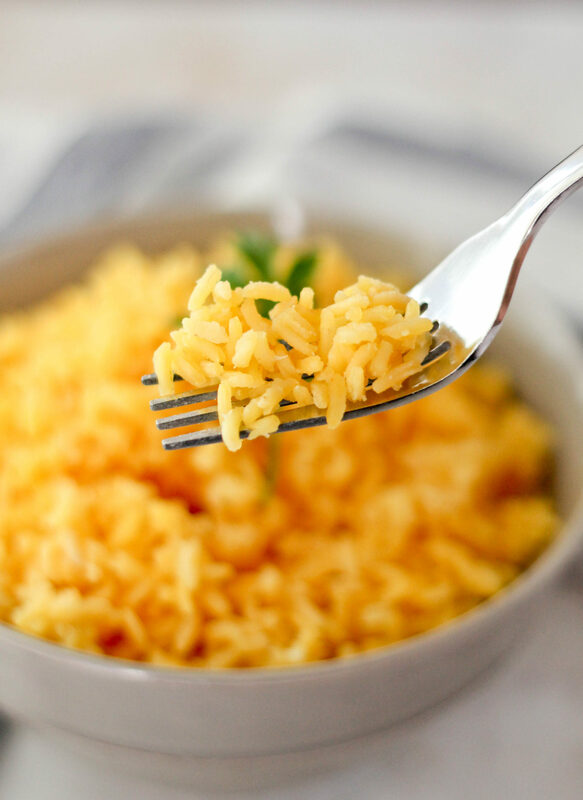 I fell in love with yellow rice many years ago in NYC when I had it at a local Cuban restaurant. I have a habit of going home and recreating dishes that I’ve eaten in restaurants so of course I had to give yellow rice a go. Sazon con Azafran has become my go to when making yellow rice. I’ve tried different ways of achieving the signature yellow by using tumeric and other sazon varieties but this has given the best results when it comes to taste and color. I sometimes use the Sazon con Achiote, but keep in mind that this make the rice more orange than yellow in color. Having yellow rice with our meals is a nice break from eating plain rice, and I can easily make roasted vegetables or black beans and some sort of meat like Citrus Roasted Chicken or Salmon to complete the meal. 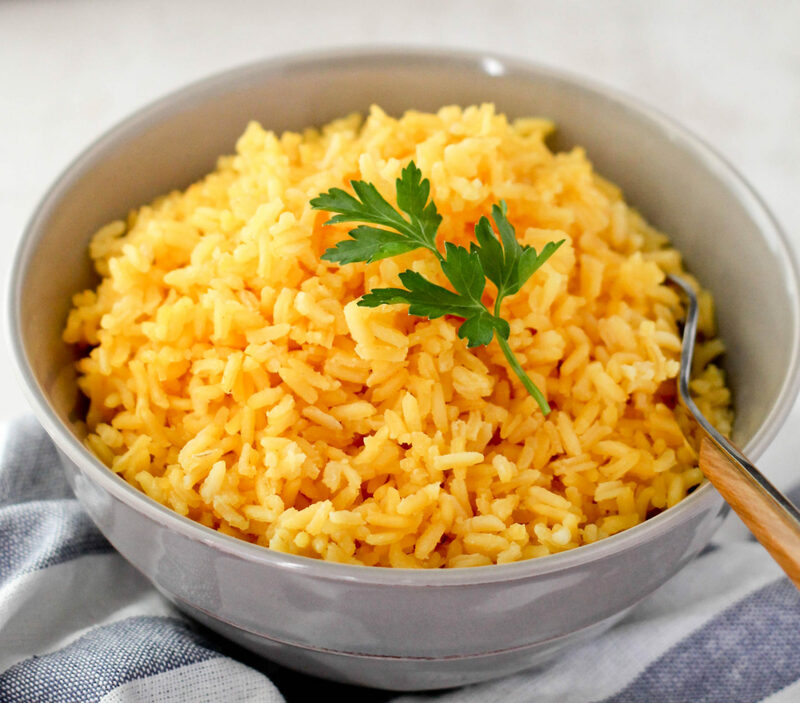 I keep it fairly simple; all it takes is just 5 ingredients to make the best yellow rice. I’ve made different versions over the years but have found this to be not only the easiest but also the tastiest. This is a basic recipe but you can add other ingredients like garlic, black pepper, cilantro and even bay leaf! When I’m feeling fancy I add them all. Enjoy! Place rice, sazon, chicken broth or water and bouillon(crush if using the cubes) in a pot a stir. Place on fire over high heat and bring to a boil. Stir then lower the heat to a simmer and cover pot. Cook covered for 20 minutes until all the liquid is gone. Fluff with a fork. *Water can be used instead of the chicken broth. **chicken bouillon can be removed if using chicken broth but be sure to adjust the amount of salt.